Those looking for exquisite solutions for their homes should definitely appreciate Garde console table in white gloss with lights, diamante inserts, and 1 drawer. The table will flawlessly fit into any environment and will create a flowing, luxurious feeling in any house or apartment. Highly modern glossy surface is compensated by old-fashioned minimalistic design, which will look natural both in contemporary and traditionally designed homes. Garde console table can be put anywhere – in the living room, in the bedroom, or even in the hall. Its compact dimensions and light-weight design make it perfect for all kinds of homes. In addition, its white glossy surface can be combined with a wide range of color palettes, which means that it won’t be difficult to integrate Garde console table into your already finished and designed interior. Even if your home is decorated in a variety of colours, white will always look great next to anything. This is always a wise choice, especially when you want to contrast some darker elements in the room. The classic minimalistic look of the table is contrasted by the contemporary glossy surface and outstanding LED lights. To put it simply, Garde offers you a highly modern look that has all it takes to remain trendy for ages. Even though certain design elements may lose their relevance over the years, Garde’s carefully designed combination of contemporary and traditional elements will not. LED lights, included in the model, create the feeling of elegance, top notch style and undeniable comfort. This table will look particularly stylish in a spacious hall next to mirror (the latter one should be purchased separately). However, it will also look great in the corner of a study room. A functional drawer will give you a chance to store some of the items you do not use very often. 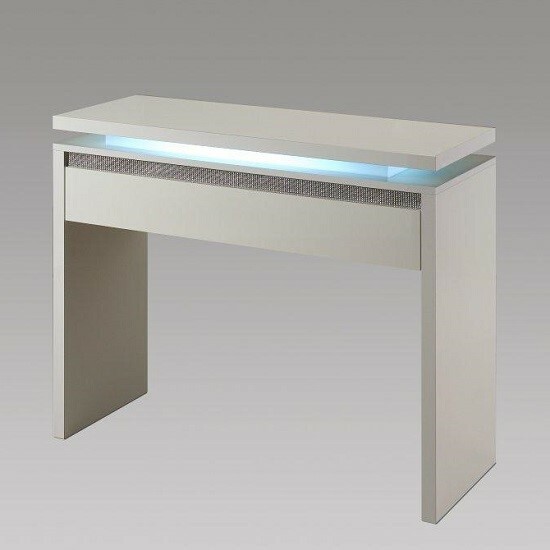 Diamante inserts contribute to the light and luxurious feeling Garde console table in white gloss creates. Just like LED lights, diamante inserts are the elements that make this table look stylish and up to date. The classic rectangular shape and minimum decoration are the classics. High quality materials used in the production ensure long lasting durability of the Garde console table. White lacquer surface is not easy to scratch; it is water and temperature proof; it is designed to serve you for ages. Plus, given the combination of traditional and contemporary design elements in this product, it is highly unlikely that you will want to replace this furniture item any time soon. In addition, Garde offers you an entire serious of matching furniture items, and you can easily find them on our website. 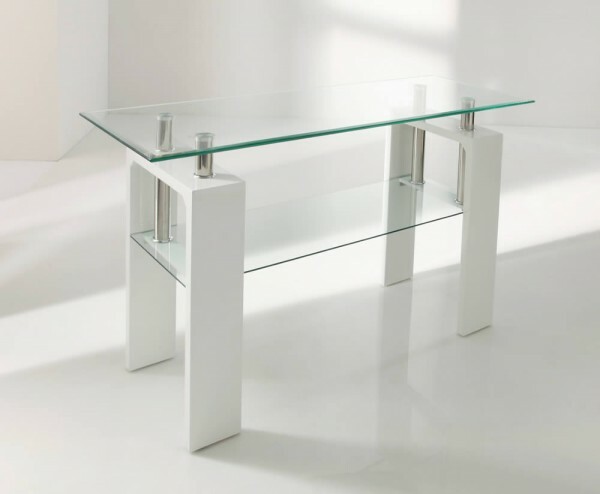 However, even without matching items, Garde console table will look astonishing in any apartment. Article provided by Furniture Stores UK — online furniture search engine 24/7.